The hen harrier is a raptor species of conservation concern in Ireland and the UK and protected regionally under The Wildlife Act 1976 & Amendment Act 2000. Hen harriers are listed on Annex 1 of the Birds Directive (2009/147/EEC) and are currently considered an All‐Ireland Species of Conservation Concern. The EU Birds Directive provides a legislative framework of measures required for assessing and ensuring the conservation of the hen harrier which includes monitoring, research and the designation of Special Protection Areas (SPAs). 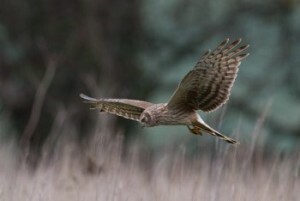 Six sites have been designated as SPAs for hen harriers in Ireland (see http://www.npws.ie/); the Slieve Bloom Mountains SPA (Counties Laois & Offaly; Site Code 4160), the Stackʹs to Mullaghareirk Mountains SPA, West Limerick Hills and Mount Eagle SPA (Counties Cork, Kerry & Limerick; Site Code: 4161), the Mullaghanish to Musheramore Mountains SPA (County Cork; Site Code: 4162), the Slievefelim to Silvermines Mountains SPA (Counties Limerick & Tipperary; Site Code: 4165), Slieve Beagh SPA (County Monaghan; Site Code 4167) and the Slieve Aughty Mountains SPA (Counties Clare & Galway; Site Code 4168). The Birds Directive also has several implications for EU member states in relation to protected species. These include the maintenance of viable hen harrier populations (Article 2); the preservation, maintenance or re‐establishment of a sufficient diversity of areas and habitats (Article 3 & Article 4); the encouragement of necessary research and scientific work with regard to the objectives above (Article 10) and reporting to the Commission every three years on the progress made with respect to achieving the above requirements (Article 12). The Birds Directive thus provides a statutory and legislative basis for national surveys and conservation strategies by creating a requirement to monitor and conserve the hen harrier population. Fundamental to establishing population status, distribution and change is the requirement for surveys of breeding areas to incorporate all suitable habitats not just those locations where they occurred historically since some of the habitats (notably plantation forests) may change over time. The core aim of this project is to provide an assessment of the population status of the hen harrier in Ireland and compare this to previous survey estimates (1998 – 2000; 2005 & 2010). Specifically this requires examination of the breeding range(s) and suitable breeding habitat in which hen harriers occur in Ireland. This requires national data on spatial occurrence and analysis of spatial data, to examine regional and/or national spatial and temporal changes. As one of Ireland’s rarest birds of prey, the long-term declines in Hen Harrier populations provides cause for concern, particularly given the important role this species has to play in our wild and rural landscapes. Hen Harriers are renowned for their spectacular aerial courtship displays known as the ‘skydance’. Traditionally, Hen Harriers breed in open upland habitats, using heather, pre-thicket forest plantations or scrub for nesting while feeding on small birds and mammals. Like many birds of prey, Hen Harriers are a valuable indicator of the health of our countryside. The 2015 National Survey of Hen Harriers (the fourth national survey since 1998-2000) has shown that the national population has experienced further declines, including within some former strongholds for the species. In the coming weeks as spring approaches the enigmatic hen harrier will begin displaying and looking for a place to nest in the uplands typically on deep heather moorland and in young forest plantations or scrub habitats. There is no greater sight than the “sky-dancing” display of the white-grey and black-wing-tipped male hen harrier showing off to the brown, more camouflaged, white-rumped females in spectacular undulating flights which rise and fall rapidly 100’s of metres in mid-air.